In the year after -- and honestly for some time before -- the 2012 presidential election, talk among the pundit class and in circles in and outside of Washington shifted to who may next occupy the White House following the 2016 cycle. Such is the rite that is the invisible primary. However, the candidates, prospective or otherwise, are but one part -- the most visible part -- of this period between the last presidential general election and the first contest of the next presidential nomination cycle. Garnering far less attention, yet almost perpetually occurring, are the almost ad hoc machinations of various national and state-level actors in setting the rules that will govern the next presidential nomination process in both parties. There is a rough sequence to all of this. Typically, the national parties are the first to act in setting the general guidelines for presidential delegate selection either at the prior convention -- as the Republican Party has done throughout much of its history -- or in the year or two following the previous presidential election -- the modus operandi of the Democratic Party. The 2016 cycle offers a bit of a departure from that pattern in that both national parties now have the ability to tweak or fundamentally change their respective sets of delegate selection rules. What that means is that the 2016 cycle is currently lodged in a period in which the national parties are still tinkering with their rules. The Republican National Committee has a baseline set of rules that came out of the Tampa convention in 2012, but just recently appointed a subcommittee 2 within its Standing Committee on Rules to reexamine the party rules. The Democratic National Committee, on the other hand, is lagging by comparison. The DNC just within the last month set its membership on the Rules and Bylaws Committee 3 that will take up and complete the 2016 rules during 2014. The 2016 rules, then, are something of an unknown at this point in the cycle. Fully known or not, the national rules do not necessarily deter states -- state parties or state governments -- from acting, though most oblige by waiting until the year immediately prior to the next presidential nomination contest before responding or adapting to any changes the national parties have made to their rules. 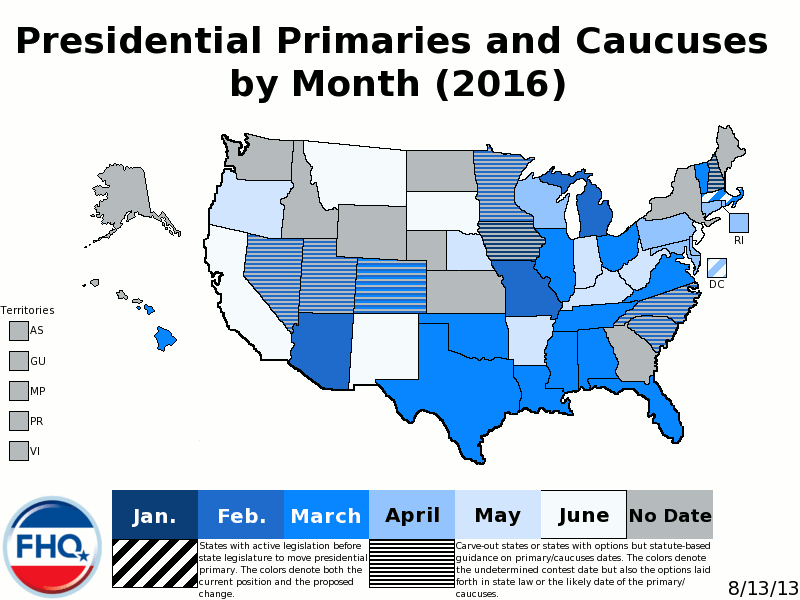 During the 2012 cycle, for example, the bulk of states devised state-level delegate selection plans in 2011: setting the dates of their primaries or caucuses and determining how the parties would allocate and select delegates, among other things. It is that state-level power in scheduling the dates of presidential primaries and caucuses that has been a particularly thorny issue for the national parties and the presidential nomination process itself. In the time since the McGovern-Fraser Commission 4 reforms reshaped the way in which presidential nominees are/were selected in the Democratic Party -- and ultimately the Republican Party as well -- states have been motivated in different ways in scheduling their delegate selection events. 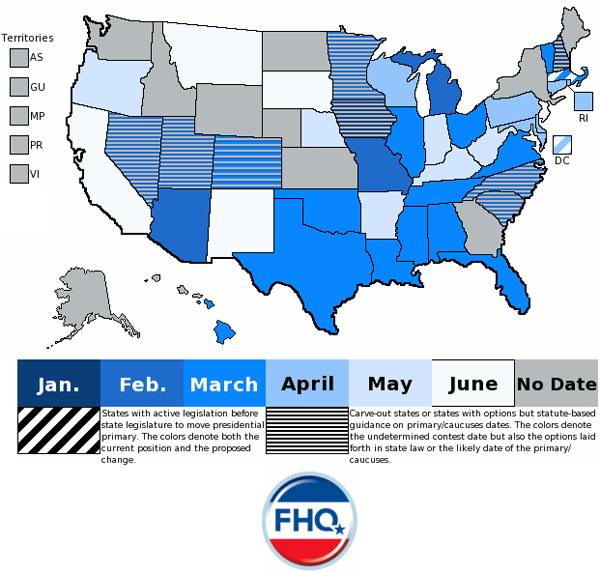 Generally, some states have been content to hold consolidated presidential and state/local primaries later on the primary calendar while other states have over time pushed up, and in some cases gone beyond, what has been allowed under national party rules. With few exceptions, the cycles from 1972-2008 5 witnessed an increasing number of states clustering at the earliest date on which the parties allowed states to conduct primaries or caucuses. This so-called frontloading problem, which progressively nudged the nomination system toward a de facto national primary date, was compounded during the 2008 cycle when a handful of states -- Florida and Michigan among them -- challenged the national party rules on timing. To that point in the evolution of the post-reform nomination process, challenges to the national party rules of this nature had been exception rather than rule. Challenges to the lofty positions that the Iowa caucuses and New Hampshire primary occupy on the primary calendar were nothing new in 2008, but the potential effectiveness and scale of the challenges were. That larger states like Florida and Michigan were threatening the earliest states and flouting concrete national party rules in the process was problematic to the national parties' end goal of maintaining control and order over the presidential nomination process. By pushing the earliest -- the so-called carve-out -- states ever closer to the beginning of the calendar year, the provocations from Florida and Michigan during the 2008 cycle provided little relief to the clustering of state contests early on the calendar that was producing a near-national primary. Not only were states still motivated to go as early as possible in order to provide primary and caucus voters with a voice in the nomination contests, but the “lost in the shuffle” nature of the bunching of primaries and caucuses on the earliest allowed date was also motivating some states to differentiate themselves in the process by going even earlier, thus potentially extending the overall length of the nomination contest. At the very least, the calendar of contests stretched from the beginning of January to the middle of June as opposed to a later start in February or March as the national parties desired. The 2008 provocations made strange bedfellows out of the DNC and RNC. Some within both national parties saw the need for and utility in coordinating the parallel but not mirror image processes to some extent. While the subsequent informally coordinated 2012 calendar structure was a necessary first step in reining in the types of primary calendar shenanigans that befell 2008, further challenges to the rules during the 2012 cycle pointed out that the moves were not sufficient to the national parties arriving at that end. The penalties for violations were neither coordinated across the two national parties nor severe enough to deter states from acting. It is there, with that as the backdrop, that we now find the 2016 cycle. The RNC has added a much more draconian penalty 6 for rules violations that largely approximates the DNC Rules and Bylaws Committee discretionary power to strip rogue states of all of their delegates. State-level actors have that as a baseline, and while the majority of state-level, date-setting action may take place in the year immediately prior to the next presidential election, that does not mean all of it does. In fact, 2013 has proven to be an interestingly active period for 2016 calendar 7 movement on the state level despite neither national party having set its 2016 delegate selection rules in stone yet. First and foremost, the poster child of rogue states over the last two cycles -- Florida -- has deescalated some of the uncertainty that surrounded the setting of the date of the Sunshine State presidential primary the last two cycles. The Presidential Preference Primary Date Selection Committee (PPPDSC), the group charged with setting the primary date, is no more. As Florida law stood heading into the 2013 state legislative session, the PPPDSC could wait until most states had already set dates -- Sept. 30 of the year before a presidential election -- to schedule the Florida presidential primary. That left it uncertain as to whether the Florida question would be answered until late 2015. However, the combination of a favorite son, Marco Rubio, potentially running for the Republican nomination and the likelihood of the state having its delegation reduced to just nine delegates proved to be enough impetus within the Republican-controlled Florida legislature to move the primary back 8 to the “first Tuesday that the rules of the major political parties provide for state delegations to be allocated without penalty”; presumably the first Tuesday in March 2016 and likely compliant with both national parties' set of rules. Florida, then, has disarmed, but Michigan and Arizona -- both rogue states in 2012 9 -- still remain potential problems for the 2016 calendar and to the national parties. Both states currently have laws in place that schedule their primaries for the last Tuesday in February. That is a position that is not compliant with the past structures of the Democratic Party rules, but fits into a gray area in the current Republican Party rules. As outlined now, the RNC delegate selection rules 10 prohibit states from holding contests earlier than the first Tuesday in March. However, those same rules do not penalize a state for such a violation unless the contest is before the last Tuesday in February. Arizona and Michigan both fit into that gray area. The contests are both on but not before the final Tuesday in February and thus avoid the super penalty while still technically breaking at least one part of the rules. That incongruence across the baseline DNC and RNC rules means Arizona and Michigan could be 2016 calendar headaches on some level for at least one if not both parties. The 2013 state legislative session has not been all about the usual suspects with respect to states threatening the 2016 presidential primary calendar. North Carolina recently joined the fray with legislation that creates and positions a separate Tar Heel State presidential primary 11 on the Tuesday following the “first in the South” South Carolina primary. The North Carolina move is provocative to South Carolina 12 in that the parties in the Palmetto State have acted in the past to keep at least a week between its typical Saturday contest(s) and other southern primaries or caucuses. But the North Carolina law would place the primary on the Tuesday after that Saturday primary, a violation of the South Carolina custom. That affects South Carolina, but also impacts the dates of the other carve-out states -- Iowa, New Hampshire and Nevada -- and thus the national parties' best laid plans as well. The other noteworthy aspect of the structure of the North Carolina law is that it is indicative of an emerging pattern in legislation affecting the scheduling of presidential primaries. That is to say that some states are moving away from setting firm, fixed dates for those contests. Instead, the legislation has become more creative, anchoring the primary date in one state to the primary date in another as the North Carolina law does or a similar Arizona bill 13 (anchoring the primary in the Grand Canyon State to the Iowa caucuses) attempted. The change in Florida is similar, anchoring the Sunshine State primary to the beginning of a particular (penalty-free) point on the calendar. This is a unique way for state legislatures to avoid the problematic issue of constantly moving subsequent primary shifts through the legislature. It streamlines that process in a way similar to states that have ceded the power to set primary dates to secretaries of state, as is the case in New Hampshire and Georgia, or governors like in Arizona. It is that type of give and take between the national parties and states -- a kind of tweak, respond and adapt sequence -- that will interact to set the playing field on which those prospective presidential candidates now informally jockeying for position within the two parties will compete in 2016. That sequence of interactions in 2014 and 2015 will yield a sequence of delegate selection events in 2016 that will in part determine who emerges as the nominees for both parties. The candidate actions may make the headlines and filter into the Twitterverse, but the behind-the-scenes maneuvering is quietly important as well.